Ironically, climate activists have previously sought to blame bridge problems on 'global warming'. 2016: Extreme cold causes Canadian bridge to split. TORONTO – A northern Ontario bridge that is part of the Trans-Canada Highway has been closed indefinitely, police said on Sunday, after media reports it split because of extremely cold weather. 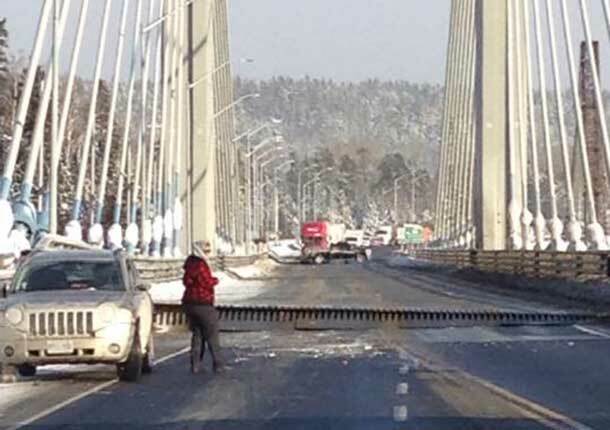 The Nipigon River Bridge, a cable-stayed bridge that opened in November, was closed because of “mechanical issues,” Ontario Provincial Police said. Twitter images showed a gap splitting the highway. “My first thought was, Canada is cut in half,” Nipigon, Ontario, Mayor Richard Harvey told online news site TB News Watch. How cold weather could have played a role in the failure of the Nipigon Bridge – Jan. 11, 2016 – Ontario experienced a deep freeze. In Nipigon, the temperature went from -6.3 C on Saturday to -15.7 on Sunday. As well, the area experienced high wind gusts as the system bringing the cold weather rolled in…When it comes to the cold weather, bridges — typically comprised of steel cable and concrete — react just like anything else. The steel and concrete expand in warm weather and contract in cold. The cables of a cable-stayed bridge like the one in Nipigon are fasted from a main tower to the ends with bolts. In the cold, the steel in the cables would contract causing the bridge to want to uplift. But that’s what the bolts at the ends are for: to counter that. Though it’s unknown what happened, Green said that it could have been a combination of factors that made the perfect storm: cold weather could have compromised the bolts and the wind could have caused uplift. If the cables had iced, that could have compromised the bridge as well. Melissa Hortman of the Minnesota House of Representatives “speculated that 90-plus-degree heat Wednesday and the above-normal temperatures of the past two summers may have been a contributing factor,” and said “You wonder if this bridge was built to withstand the massive heat we have had this summer.” Or even if it was built to withstand heat, whether its structural deficiencies undermined the design integrity to a point where heat contributed to the collapse. Certainly climate change will have the biggest infrastructure impact on our coastal cities, water and sewage systems, levees, and electric grid. But given that a remarkable 70,000 other bridges in the country are also structurally deficient, we should seek to learn whether such troubled bridges can take the ever-growing stresses generated by global warming. We need to be as prepared as possible for a changed climate – as the Center for American Progress has previously argued. Indeed, if the adapters have their way in blocking serious efforts aimed at prevention, we’ll need to be prepared for the very worst. Hat Tip to IceAgeNow.Info website.